You can have it all in this gulf access home in the highly desirable community of Brendan Cove, a gated, boating community. This home and all homes on the east side of Driftwood Drive are exempt from HOA fee and restrictions. No HOA fees! For the boaters, this outstanding, oversized lot offers 107 feet of concrete seawall waterfront on a wide canal and is complete with dock, plus a covered electric boat lift. The spacious home offers 4 bedrooms, 3 full baths. The home is light & bright with high ceilings. The floor plan is the split design. This home has been well cared for & most recently undergone significant improvements that include re-screened pool lanai, a full new tile roof plus new sod & an irrigation sprinkler tune up. The bright & open kitchen features raised wood cabinetry, Corian style counters and mitered glass window in the breakfast nook This home is perfect for entertaining as all of the sliding doors open to relaxed outdoor living on the large screened lanai with custom laid Travertine decking. Enjoy boating or paddle boarding from your own back yard which is only a few lots away from the Imperial River and a short ride to the back bays or Gulf of Mexico. © 2019, The data relating to real estate for sale on this Website come in part from the Broker Reciprocity Program (BR Program) of M.L.S. 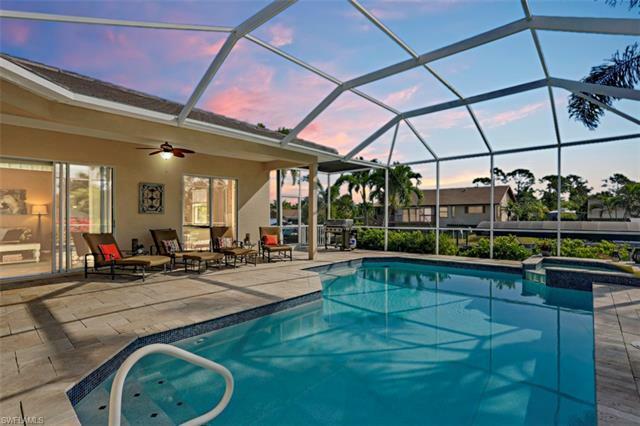 of Naples, Inc. Properties listed with brokerage firms other than Dowing Frye Realty, Inc. are marked with the BR Program Icon or the BR House Icon and detailed information about them includes the name of the Listing Brokers. The properties displayed may not be all the properties available through the BR Program. BR data on this website is provided by Dowing Frye Realty, Inc. on behalf of Chris Griffith. The source of this real property information is the copyrighted and proprietary database compilation of the M.L.S. of Naples, Inc. Copyright 2006 M.L.S. of Naples, Inc. All rights reserved. The accuracy of this information is not warranted or guaranteed. This information should be independently verified if any person intends to engage in a transaction in reliance upon it. Data last updated 2019-04-22 16:58:34.